These are light and savory, fresh and crisp. Topped with sliced avocado and more tahini, with a sliced Roma it was perfect for me. Sift together flour, baking powder, xanthan gum and salt. Add soda, milk, oil and agave, stirring until just combined. 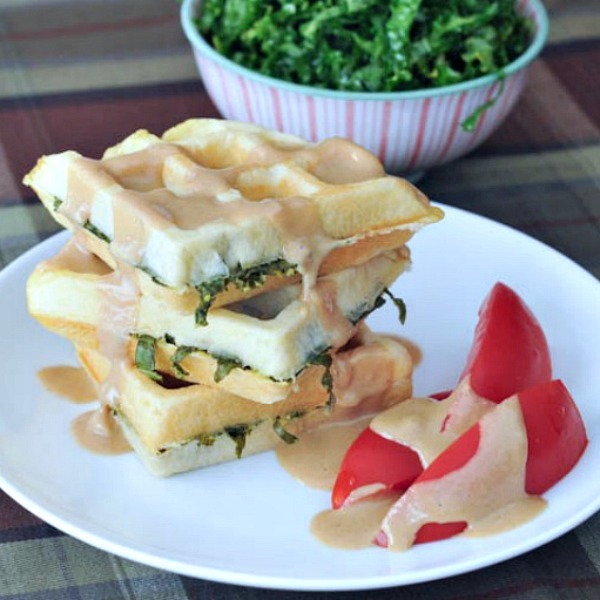 Pour a small amount (1/4 to 1/3 cup, depending on size of iron) into prepared waffle iron, add tahini kale salad to the middle (leaving an inch or so border), cover with another 1/4 cup batter. *an even easier way to make stuffed waffles? use vegan puff pastry! In large bowl, whisk together tahini, lemon juice and salt + pepper, set aside. Remove stems/ribs from each kale leaf, roll tightly and chiffonade. Place in bowl with tahini lemon. Use hands to massage, coating thoroughly. Add sea salt to taste. What should I stuff in a waffle next? 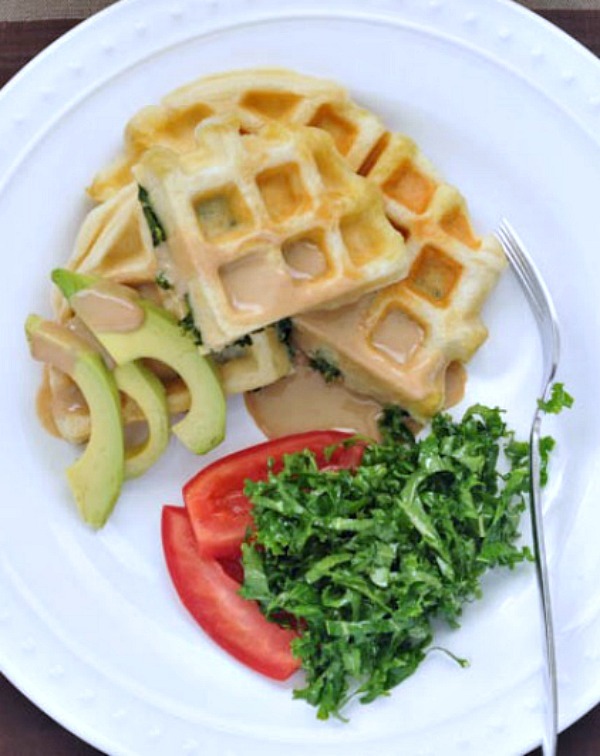 Pour a small amount (1/4 to ⅓ cup, depending on size of iron) into prepared waffle iron, add tahini kale salad to the middle (leaving an inch or so border), cover with another ¼ cup batter. Oh…my…god. I made a version of this tonight (I used a different waffle recipe) and WOW! This was great! I’ve been following your site for a while, but this is the first recipe I’ve tried from it. I’m super impressed! Can’t wait to try out more. I posted it over on my blog with a link back to yours. Thanks so much for sharing this! I finally made these and I love them! I used your kale recipe, but created zucchini waffles to stuff. Yum! More on the flour please? Is that exactly what it’s called and where do you find it? the flour I use is Bob’s Red Mill brand, and it is called Gluten Free All Purpose Baking Flour. I find it in the gluten free section of any major grocery store. Love this idea! I’m inspired to host a brunch to taste test these and the cheesy tomato waffles with some friends. Here it is! One more reason to get a waffle maker! These look FANTASTIC 🙂 I love sneaking in veggies…and stuffing a waffle with kale? Amazing. This sounds like the perfect combo to me!! Love this idea. 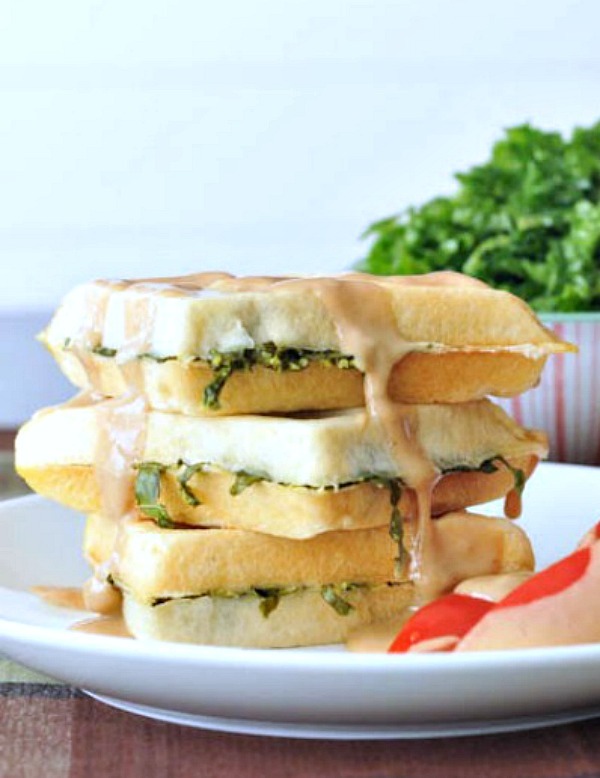 And savory waffles for breakfast also sound perfect! Every day you teach me new cooking terms (chiffonade, though perhaps I should have know that one). And now I’m going to go out a get a waffle iron. 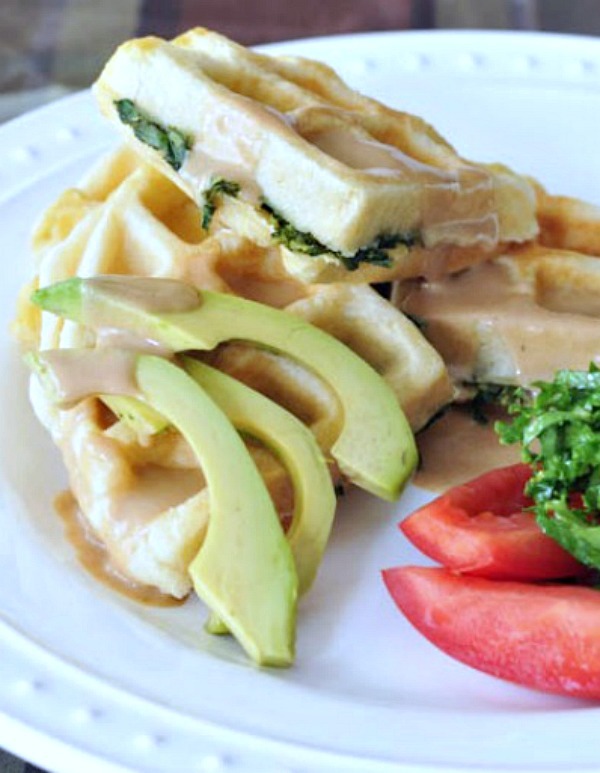 I love the idea of a savory waffle (though my hubby would be hard to convince). Wow wow, savory waffles always always get me yet I have never made them. These sound utterly delish and fresh and lovely! I love the idea of making such a simplebut wonderful salad! Never had kale salad before, and kale is so terribly hard to get here, but the season is approaching 😀 and my taste buds are *so much* looking forward already!! Oh my word. Love these waffles and now that I’ve seen them twice in one day (Barb’s), it’s all I’m craving:)Gorgeous! thanks, Lora! I know – there were several waffle recipes floating around yesterday – totally unplanned! 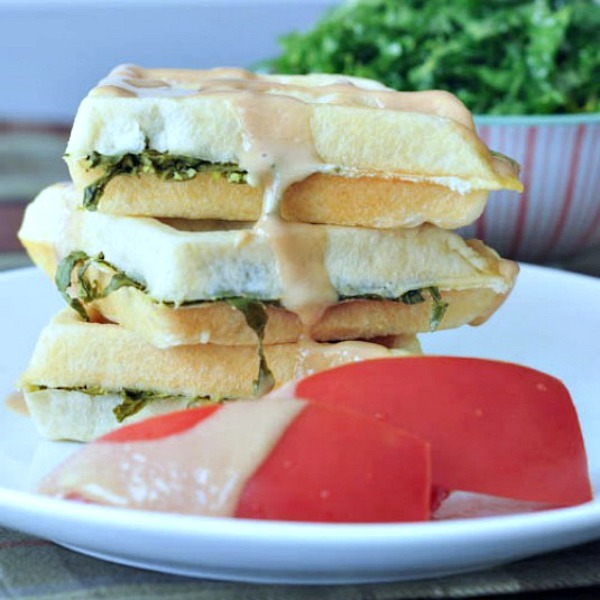 (and wow, Barb’s savory waffle sandwich?? YUM). Talk about small world! I didn’t actually stuff my waffles like you did but I did make them savory with green onion and white cheddar and then used them like bread for a BLT. Not just fun…tasty too. Now I’m on a roll and this helped; they look SO good! Barb your blt waffle sandwiches were the most beautiful I have ever seen! I bet you could make me like kale. ooooh a savory waffle! what a delicious idea! kudos! thank you for sharing – cheers! Where do you come up with this stuff? It looks amazing, as always. I always found chicken and waffles to be an odd combo, but I think kale and waffles tops that. haha Sounds good though!